This document is about the Stripe Gateway for SimpleCart version 2. Information about version 1 is here. iDeal, for accepting payments from customers in the Netherlands using iDeal. All of these gateways are part of the Stripe suite, so require you to have an active account. Compared to version 1, version 2 of the gateways require a bit more set up. This is because where version 1 only supported basic credit cards, with no 3D Secure validation, version 2 uses Stripe's newer APIs to support a wider range of payments. First, install the package from the modmore.com package provider. 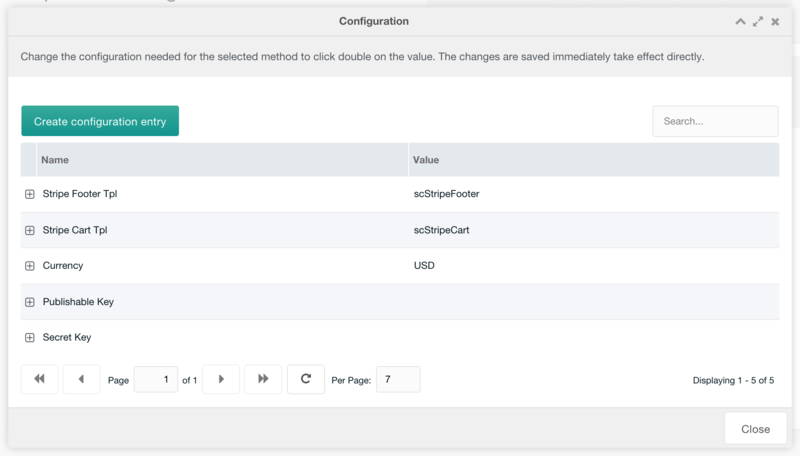 Create a webhook in the Stripe dashboard, pointing it to https://yoursite.com/assets/components/simplecart_stripe/connector.php?action=webhook. Open the webhook in the dashboard, and copy the Signing Secret into the simplecart_stripe.webhook_secret system setting, located under the simplecart_stripe namespace. Back in the Stripe Dashboard in the API > Webhooks section, click on your endpoint. Test the webhook by clicking the Send test webhook button in the top right corner. Leave it on the default event type, and click on Send test webhook button. Make sure the response looks like JSON, and has a message of Unsupported event type, ignoring request. If you get a different response, that means you might not have copied the webhook secret properly, and you wont be able of accepting payments. Head back to the Payment Methods tab in the SimpleCart > Administer component. Click the cog icon next to each of the gateways and make sure that the Secret Key is filled with your Stripe Secret Key. Activate the gateways you'd like to use. To manage the properties for the Stripe gateways, including the API Keys and what chunks are used, simply hit the Cog icon next to the name, or right click the row in the grid and choose Configuration. These properties are available for the standard Stripe gateway, which is used to accept credit card and 3D Secure credit card payments. Stripe Cart Tpl: this contains the name of a chunk that contains the html that is added into the checkout form. This contains an empty div where a "card" element is inserted. Previously, in v1, this included actual input fields but that meant additional PCI requirements. 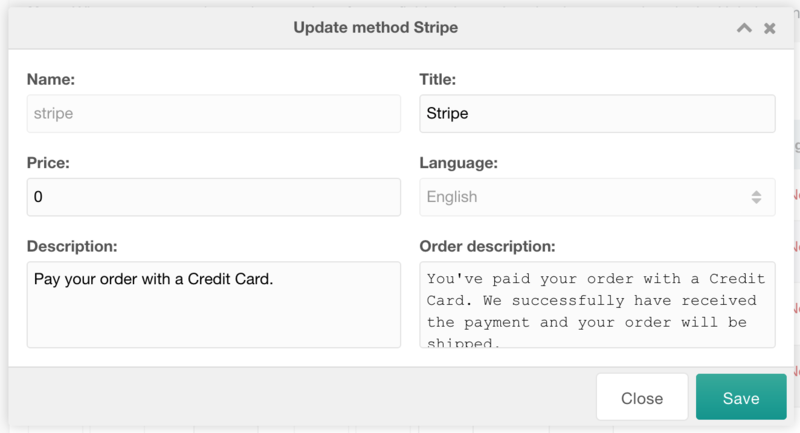 Publishable Key: the publishable key for your Stripe account can be found in the Stripe Dashboard, under Account Settings > API Keys. This can be either the live and test Publishable Key. Secret Key: the secret key for your Stripe account. Can also be either the live or test key. Use 3DS if optional: when set to 1, the default, the gateway will attempt to use 3D Secure whenever possible, including if 3DS is optional for the provided card. When set to 0, optional cards will be charged directly without 3D Secure validation. For Bancontact you only have the Currency (which should be EUR) and Secret Key property, just like the Stripe gateway. For iDeal you have a Currency, Secret Key, and Cart Tpl property, just like the Stripe gateway. The iDeal gateway keeps a list of banks in its scStripeIdealCart chunk, which you may need to update once every few years. To manage the title, description and transaction fee for the gateways, you right click the gateway in the list and choose Update Method. In the popup, you can then edit those values, which are stored into lexicons.